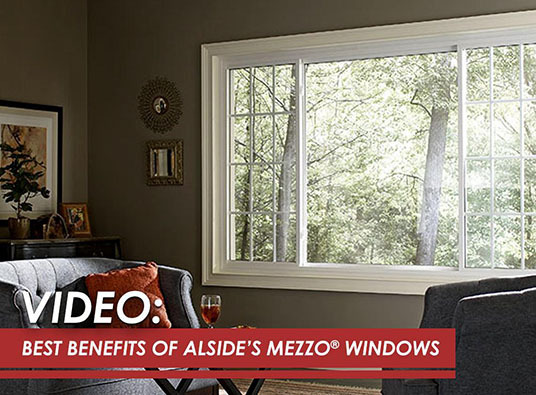 Mezzo® may just be one of Alside’s many vinyl window varieties, but it sure is special. With its amazing set of features, it offers everything you want from attractive, energy-efficient, durable, and low-maintenance glass units. Other than its advanced insulated glass solution, the internal chambers of Alside’s EdgeForce frame and sash promote greater energy efficiency. In addition, the CoreFX™ composite reinforcement contributes to Mezzo’s already exceptional thermal performance. Its non-conductive design helps reduce heat transfer. Plus, Mezzo’s multi-layer weatherstripping helps prevent energy loss. With all these components in one product, Alside-certified window companies know that a Mezzo lets you meet future ENERGY STAR® energy performance ratings today. Unlike inferior vinyl products, Mezzo never quits. It combines the power of EdgeForce, CoreFX, HP3™ telescoping sill, and Gatekeeper™ interlocking sash-to-sill technology for remarkable rigidity and stability. They form a unified wall of strength to eliminate bowing and preserve its structural integrity. The Forecaster™ creates a slight slope to shed water and minimize the chances of infiltration. It creates a highly efficient drainage system that induces water runoff. Combined with three layers of weatherstripping, Mezzo windows are ready for one inclement weather after another. To photograph bigger pieces of the outside world, the EdgeForce’s low-profile design produces an expanded glass area. In turn, Mezzo can open up your space and turn the best angles of nature to large portraits. When it comes to design, Mezzo puts you in full control of your window replacement. You have plenty of grid patterns and color options; make your home stay true to its quintessential style or inject a transitional or eclectic vibe. With our guidance, you can tailor Mezzo windows to your aesthetic and functional requirements. Give your Michigan home the windows it deserves. Call Kroll Construction now at (888) 338-6340 now to schedule your FREE, in-home consultation to get your Mezzo window upgrade started.